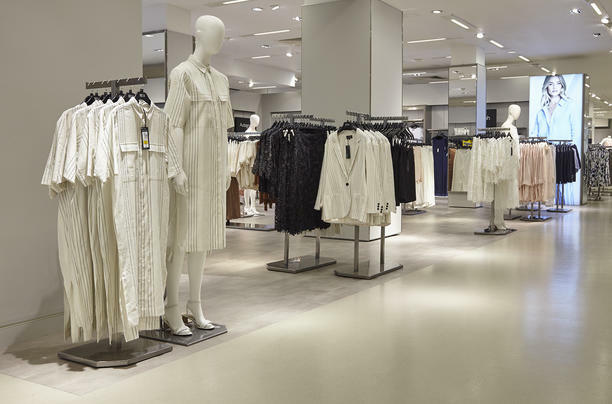 Bespoke flooring creates a stunning shopping experience at the Marks & Spencer flagship store in London. Marks & Spencer (M&S) has long been a British institution – more of a way of life than just a department store. With 852 stores across the UK, it is the mainstay of the UK high street. For its flagship store on Oxford Street in London, the M&S Pantheon, it was important that the interior design reflected the significance of the brand. To ensure that this look was achieved, M&S Pantheon turned to Tarkett for a flooring collaboration as part of its refurbishment. Tarkett has provided flooring for M&S for over five years, but this is the first time that they have collaborated to create a bespoke design. The new product is being trialed first with the Pantheon store in the 150m2 of the Autograph section, the modern, luxurious arm of the women’s clothing department, before being rolled out across the other outlets. For this project, the design team wanted to create a harmonious shopping environment through neutral muted tones. The store, which previously had ceramic flooring, preferred to keep the same aesthetic but instead use a more hardwearing alternative. The floor is a custom light gray color of iD Inspiration 70 luxury vinyl tiles (LVT) designed in conjunction with M&S, to ensure that the style was right for the store and fit seamlessly with the M&S brand concept. Bringing clean lines to the Autograph area, the plank-style tiles help to zone space, while their light reflecting properties brightens the store. The soft color also makes the section appear clean and open – a look that the store was keen to emulate, to help appear more welcoming. While traditional ceramic tiles are difficult to install and to replace if damaged, the advantage of using LVT is the simple maintenance – the planks are easily installed or replaced. For a store such as the Pantheon with such a high footfall, this was an imperative aspect of the product. Paul Brackstone, global design manager at M&S commented “We have worked with Tarkett for over five years, but this is the first bespoke product that we have created together. We wanted the look of the new product to be as close as possible to the feel of the previous ceramic flooring, but offer a more practical solution to our needs. CCSD needed to find a flooring solution that was cost effective, aesthetically pleasing and energy efficient. Shedding the look and feel of a traditional bank, the new Virgin Money Store in Glasgow has opted for an ambiance centred on home and leisure, complete with a custom-designed dance floor.